1 Cut a cross into each tomato, drop into boiling water for a few seconds, then skin, remove the stem scar and cut the tomatoes into quarters. 2 Peel and finely dice the onions and garlic. Chop the anchovy fillets. 3 Heat the butter in a pan and briefly sweat the onions, garlic and tomatoes. Add the anchovies, herbes de Provence, bay leaf and thyme, then add the stock. 4 Put a lid on the pan and simmer the soup over a low heat for about 20 minutes. Remove the bay leaf, puree the soup and push through a sieve. 5 Reheat and season to taste with sugar, salt and pepper. 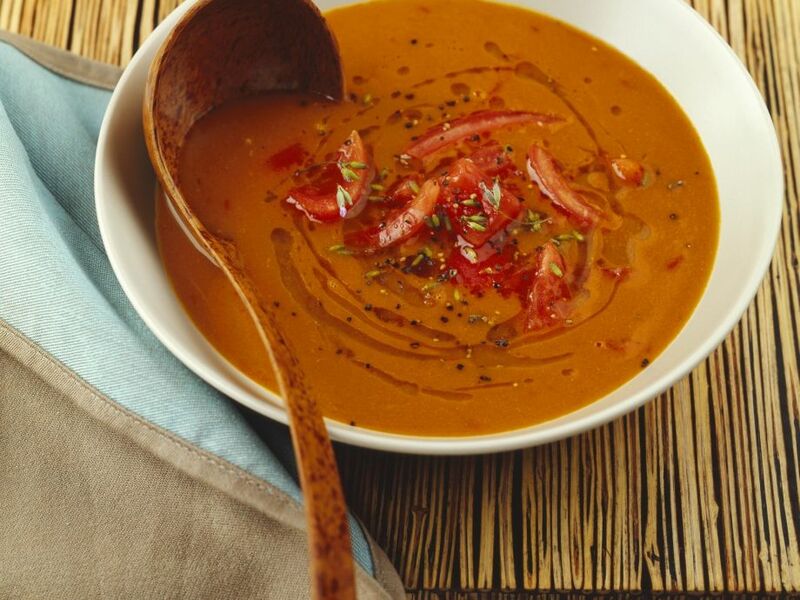 Ladle the soup into plates and serve garnished with the tomato, oil and herbs.